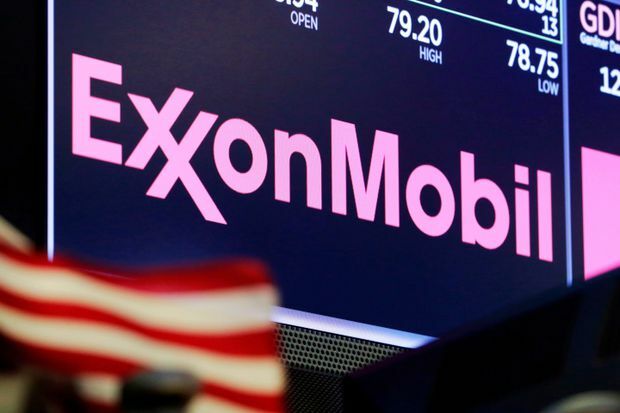 The logo for ExxonMobil appears above a trading post on the floor of the New York Stock Exchange on April 23, 2018. Exxon Mobil Corp. has scrapped plans for a $25-billion liquefied natural gas terminal in British Columbia – the latest LNG project cancelled on the West Coast. While Royal Dutch Shell PLC announced in October that it will forge ahead with the massive LNG Canada joint venture in Kitimat, B.C., at least 15 LNG proposals in the province have either been cancelled or stalled over the past two years. Exxon Mobil and its Canadian unit, Imperial Oil Ltd., had hoped to export LNG to Asia from a terminal at Tuck Inlet, near the city of Prince Rupert in northwestern British Columbia. In a letter this week, however, the B.C. Environmental Assessment Office said the Exxon Mobil-led WCC LNG Project Ltd. venture will no longer be reviewed. “The WCC LNG project has been formally withdrawn from the environmental assessment process,” the agency said, responding to WCC LNG’s request dated Dec. 5 that the review of the Tuck Inlet proposal be halted. While the BC NDP government supports Shell-led LNG Canada, the province has discouraged any new LNG megaprojects in a bid to meet provincial climate targets for reducing greenhouse gas emissions. WCC LNG, formerly known as West Coast Canada LNG, didn’t provide reasons for its decision. In a community newsletter in the spring of 2018, managers cited “uncertain LNG market conditions and economic uncertainties” for the shutdown of a store-front office in Prince Rupert in late 2017. One small-scale B.C. proposal, Woodfibre LNG near Squamish, is considered by industry experts to be viable in the short term. Two others remain active: Chevron Corp. and Woodside Petroleum Ltd. are continuing with preliminary work on their Kitimat LNG joint venture at Bish Cove; and Steelhead LNG is studying its Kwispaa proposal on Vancouver Island. The shelving of WCC LNG is the latest in a series of decisions by energy companies to abandon a wide range of LNG plans in British Columbia. In March this year, Australia’s Woodside walked away from its plans to build Grassy Point LNG on a site near Prince Rupert. Last year, axed B.C. projects included: Shell’s Prince Rupert LNG plans on Ridley Island; the Malaysian-led Pacific NorthWest LNG joint venture on Lelu Island; the Aurora LNG consortium led by China on Digby Island; and B.C.-based Steelhead LNG’s Malahat proposal on Vancouver Island. In 2014, there were more than 20 B.C. LNG proposals vying to be the first out of the gates. Despite much hype from the previous BC Liberal government, only LNG Canada has announced that it will be constructing a terminal to export the fuel to Asia. LNG Canada’s budget totals $40-billion, including $18-billion for the Kitimat terminal and $6.2-billion for TransCanada Corp.'s Coastal GasLink pipeline that will transport natural gas from northeastern B.C. to Kitimat. All 20 elected Indigenous bands along Coastal GasLink’s route have signed project agreements with TransCanada, but a group backed by key Wet’suwet’en hereditary chiefs remains opposed. On Dec. 14, a B.C. Supreme Court judge granted an interim injunction for Coastal GasLink to remove the Unist’ot’en blockade at the Morice River Bridge. But anti-pipeline activists have thrown their support behind outspoken Wet’suwet’en members such as those from Dark House, one of 13 hereditary house groups. Hereditary leaders of five Wet’suwet’en clans are also vowing to prevent pipeline construction on traditional territory known as Unist’ot’en.